Since 1962, Oaklawn has provided comprehensive mental health and addiction services for children, adolescents and adults. In that time, we have grown from a small organization in Elkhart to four campuses in Elkhart and St. Joseph counties and nearly 900 employees. Since 2006, Oaklawn has been under the direction of President and CEO Laurie N. Nafziger and Medical Director Daniel Kinsey, M.D. We offer a full range of mental health and addiction services and are continually adapting to meet the needs of our clients and communities. Oaklawn is sponsored by Mennonite Health Services, which is accountable to Mennonite Church USA, Mennonite Brethren and Brethren in Christ churches. Oaklawn begins providing services in Elkhart. We officially open our doors on February 11, 1963. Our first medical director was Otto Klassen, M.D. The Oaklawn Auxiliary and the Oaklawn Foundation for Mental Health were established. Volunteers and donors stepped up to support our services, and have become vitally important resources in fulfilling our mission and expanding care throughout our community. Oaklawn applied to become a Community Mental Health Center under the JFK Community Mental Health Act, giving it the ability to provide services on a person’s ability to pay, further expanding the care we provide. Strategic planning and zoning began for Oaklawn Hospital, an inpatient facility built to help those who need more intensive services. Oaklawn’s hospital opened its doors with 78 beds serving children, adolescents and adults needing inpatient services. Today, Oaklawn’s 16-bed inpatient unit Cedars continues to serve adults, and the Goshen campus houses many departments. Oaklawn completes its first Capital Campaign, raising $3.75 million, resulting in the building of the Harold C. Loewen Education Center, an adolescent group home and an endowment of over $1.5 million. Oaklawn became the state-designated community mental health center for St. Joseph County. We assumed services, two buildings, more than 200 new staff members and thousands of clients. The Children’s Campus in Mishawaka joined the Oaklawn organization. Now, Oaklawn, The Children’s Campus is our adolescent residential campus, providing intensive treatment programs for youth throughout the state of Indiana. 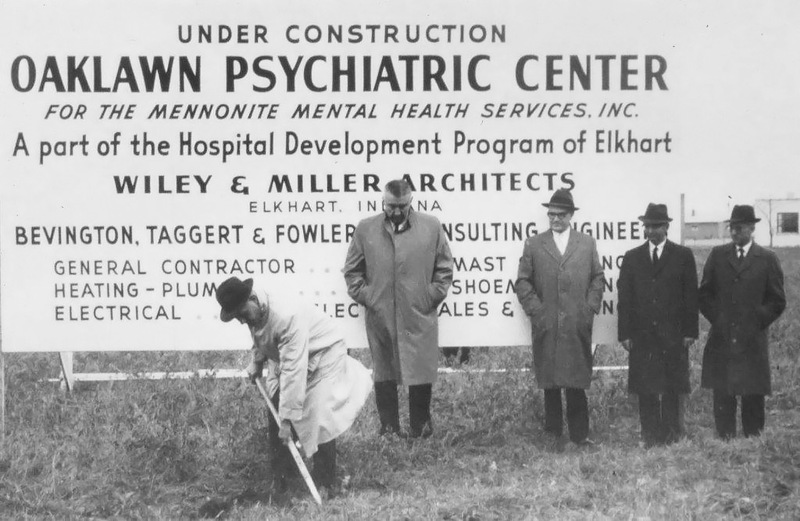 To learn more about the events preceding the opening of Oaklawn, and the Mennonite Church’s role in mental health care in North America, watch the video below.